It's all on your wrist ready to rock with a gentle flick of your fingertip. The perfect phone for anyone on the go! The fashionable versatility of the BURG creates a unique synergy that seamlessly integrates with your lifestyle rather than forcing you to adapt to it. IT HAS BEEN TESTED AND IN GOOD WORKING CONDITION. dan GOOD eals wants you to be satisfied with your item! 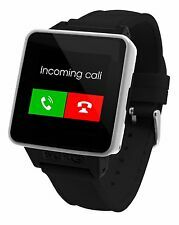 NEON 14 SMARTWATCH PHONE WITH SIM CARD. 1 SMARTWATCH PHONE. 1 SIM CARD. DENIM BLUE. YOU WILL RECEIVE. Condition: 1.USED EXCELLENT CONDITION!!! 2.100% Fully Functional!!! TESTED!!! and Sealed By Our Specialist! 3.Packed in a safe, multilayered packaging! SEE PHOTOS!!! What's Included: INCLUDED - Smartwatch, USB Cable, Battery, Headphones. We at BURG believe that Smart Watches are the future. The Smart watch Phone is the answer to that gap. Burg's mission is to use Dutch Design to produce cool, useful, and original Smart watch Phones and accessories that will change not only the phone industry, but your way of life. 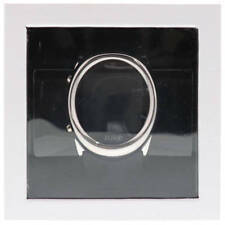 New in Box Burg 16A Smartwatch. The BURG Smartwatch is flawlessly designed providing a fusion of form and function no other Smartwatch can match. Unlike every other smartwatch on the market, Burg is the first of its kind and the leader in technology and design. Burg, WP16A102. Manufacturer Burg. Connection via Cable Micro USB 2.0. We proudly stand behind the quality of our products. We are sure that we can provide a solution that makes you happy. Input Volts 5V. This item is REFURBISHED. Burg Smart Watch Phone Assembled Product Weight. Usable as a phone or a smartwatch for daily use. SIM is included but we don't know if its usable. Watch works perfectly. Fast and responsive LCD Screen. Item may contain scratches or dents. The item itself is in working condition. Mfg. Part #: WP14512. Item model number WP14512. We at BURG believe that Smart Watches are the future. The Smart watch Phone is the answer to that gap. Burg's mission is to use Dutch Design to produce cool, useful, and original Smart watch Phones and accessories that will change not only the phone industry, but your way of life.